New engine deal secures Sunderland jobs | What Car? 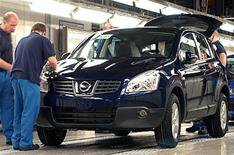 Jobs are secured as Nissan's Sunderland factory seals new engine deal. The factory will build Nissan's new 2.0-litre petrol engine, safeguarding 130 jobs and possibly creating a further 200. The new engine will power several models in the Renault-Nissan alliance, including the Qashqai, which is also built in Sunderland. Nissan says the move is part of its plans to bring production of vehicles closer to primary markets the Qashqai's 2.0-litre petrol engine is currently built in Japan and shipped to the UK. Trevor Mann, Nissan's senior vice-president for manufacturing in Europe said: 'Our employees have worked incredibly hard to improve the overall competitiveness of this part of the production process in terms of both quality and cost. Nissan says it's investing nearly 13 million over the next four years to upgrade facilities at the Sunderland factory, which would allow it to make 65,000 engines a year. Production of the new engine starts in May next year. The news follows last week's announcement from Nissan that the factory will become the European hub for the production of batteries for its electric cars.